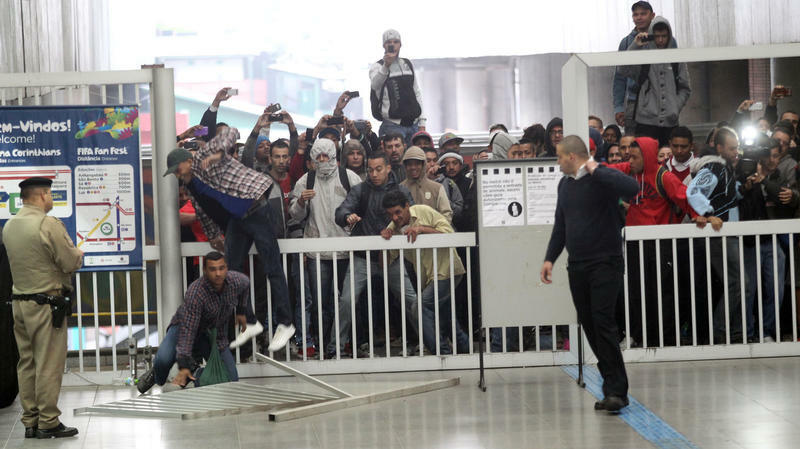 Everaldo Dias Pereira — known to his flock as Pastor Everaldo — shakes the hands of potential voters at a shopping mall in a suburb of Sao Paulo in Brazil. As he wishes them the peace of the Lord, a group of supporters shout out: "Enough of corruption, enough of people who don't know the word of God. We want Pastor Everaldo." The pastor is running for president, and even though it is unlikely he will win — polls show he only has 3 percent of the vote — his socially conservative message resonates among many of the evangelical faithful. And now on to Sao Paulo, where NPR South America correspondent Lourdes Garcia-Navarro caught the game at a bar. And, Lourdes, I assume there is collective anguish, albeit very loud anguish right now. 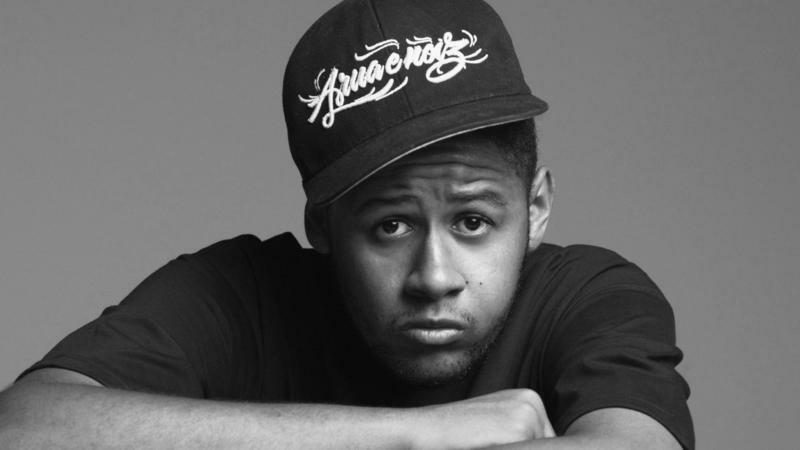 What's the mood? Brazil faces Germany today in the semi-finals of the World Cup. Deep into the tournament, Brazilian fans have developed a game day routine. 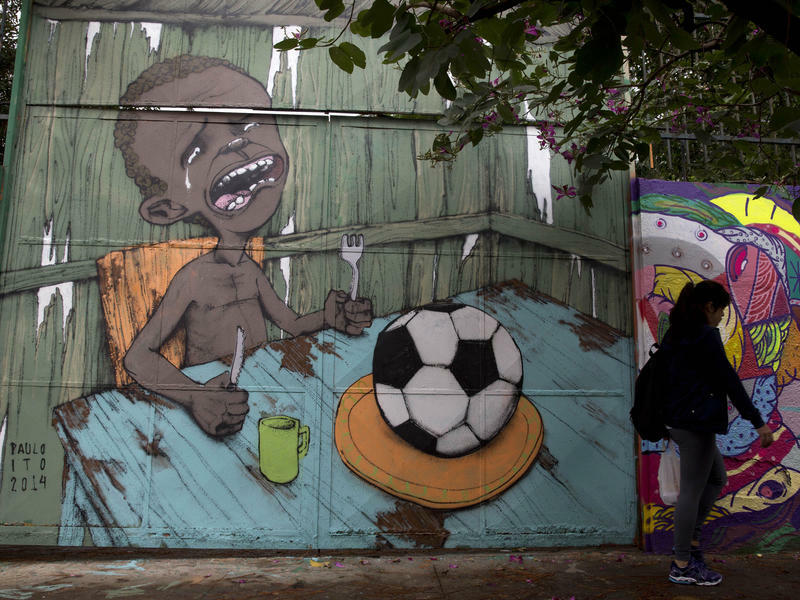 Brazilian street artist Paulo Ito has captured the spirit of the World Cup with two controversial images: One depicts a starving Brazilian boy with nothing but a soccer ball to eat; the other depicts even protesters watching the games on television. They both speak to viewers worldwide about the costs of staging the mega event. Ito explains what inspired his work and what's happening in Brazil. Luis Suarez's sponsors are dropping him, his future at his team Liverpool is in doubt and his 2014 World Cup is over. FIFA dealt the Uruguayan soccer player an unusually harsh sentence for biting his opponent, and his home country is outraged. The talk on the streets of Brazil is the host country's resounding victory over Croatia on the World Cup pitch. 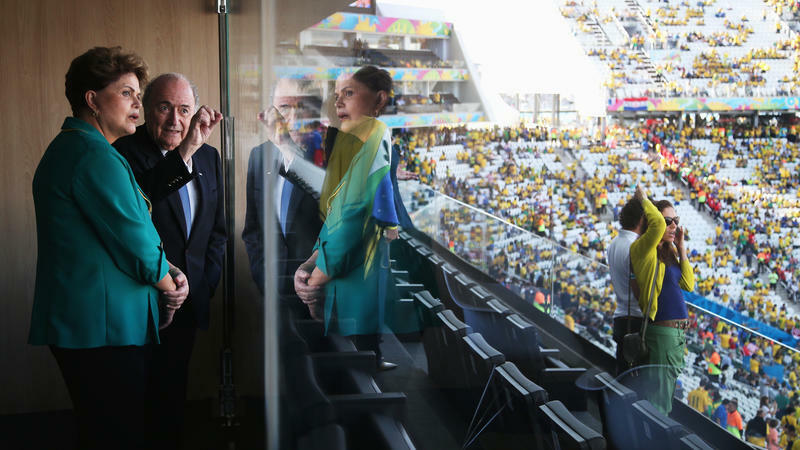 But online, debate is raging over whether or not chants directed against Brazil's President Dilma Rousseff at the stadium where she was attending yesterday's match were sexist. After the opening ceremony, fans briefly started jeering "Hey, Dilma, go f*** yourself in the a**! Hey, FIFA, go f*** yourself in the a**!" It's MORNING EDITION from NPR News. 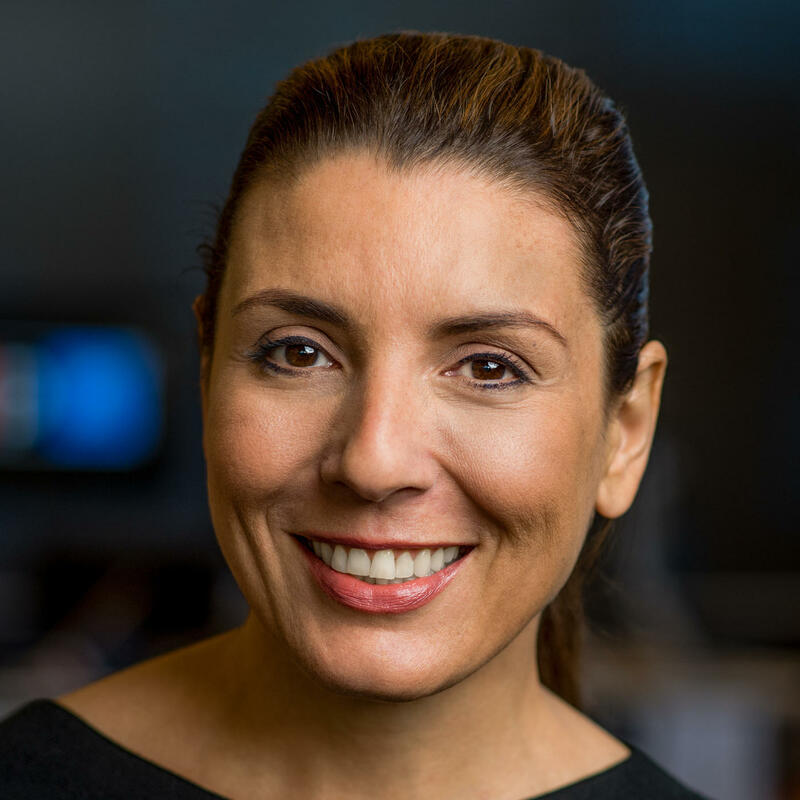 I'm Renee Montagne, and this was the sound when Brazil won its first game at the opening of the World Cup. 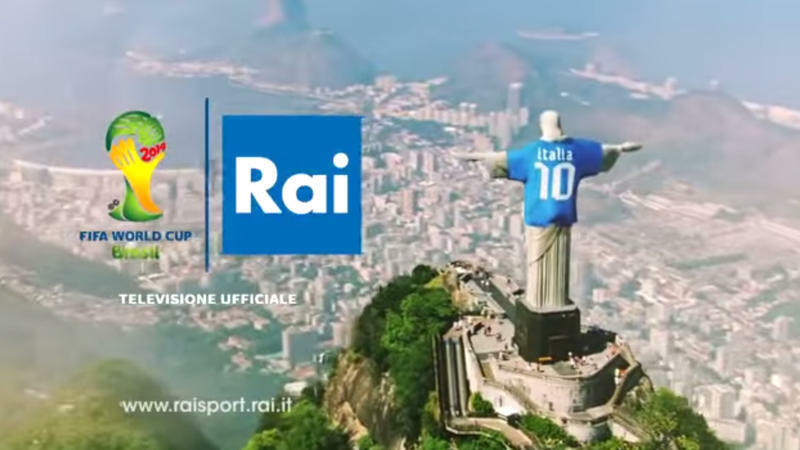 This Thursday, the eyes of the world will be on Brazil during the World Cup's opening ceremony. And there'll be a remarkable moment during that event. 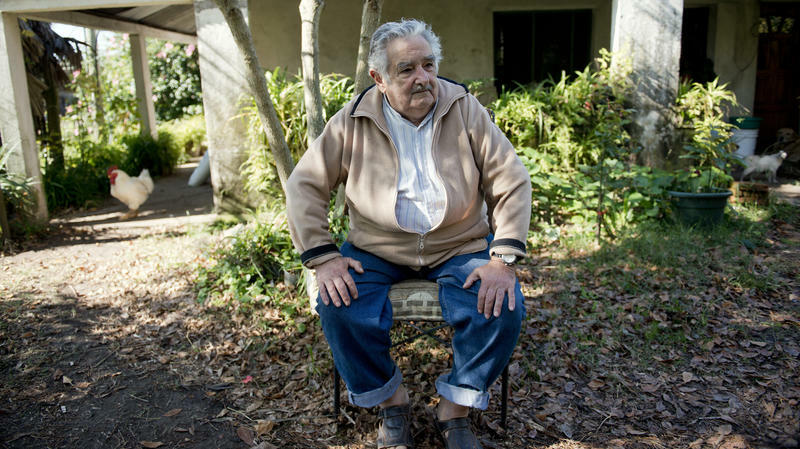 From São Paulo, NPR's Lourdes Garcia-Navarro reports. First came the bus strike. Then came the teachers. Now it's the train workers' turn. 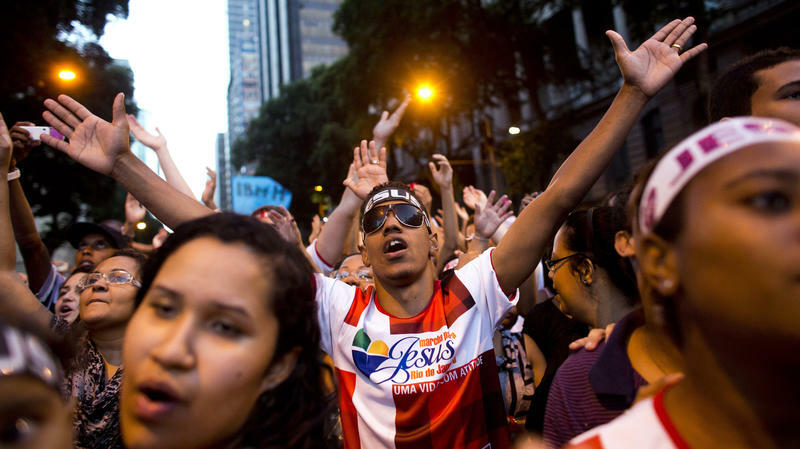 Sao Paulo will see the kickoff to the World Cup next week, but with only a few days to go, it's chaos on the streets of South America's biggest city. The stadium where the opening game of the World Cup will be played is a gleaming monument to the world's favorite sport, soccer. 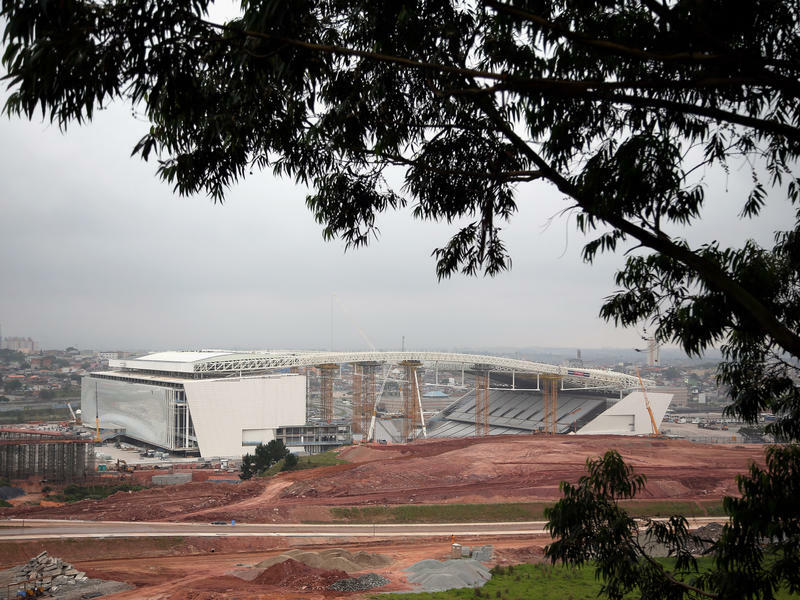 The Corinthians Arena — named after one of Brazil's most famous teams, which will take it over — has been built from scratch and boasts a massive LCD screen and state-of-the-art facilities. Last weekend, it was full of fans watching the last test match before the World Cup begins. It was supposed to be a sort of final run-through to make sure everything is ready and working. In Sao Paulo's poor north zone, in the neighborhood of Tucuruvi, teams of city workers knock on doors, warning people to take pets and small children out of the area. Quickly after, men in hazmat suits with metal cylinders strapped to their backs start spraying the street, and some of the interiors of the homes, with powerful pesticides. 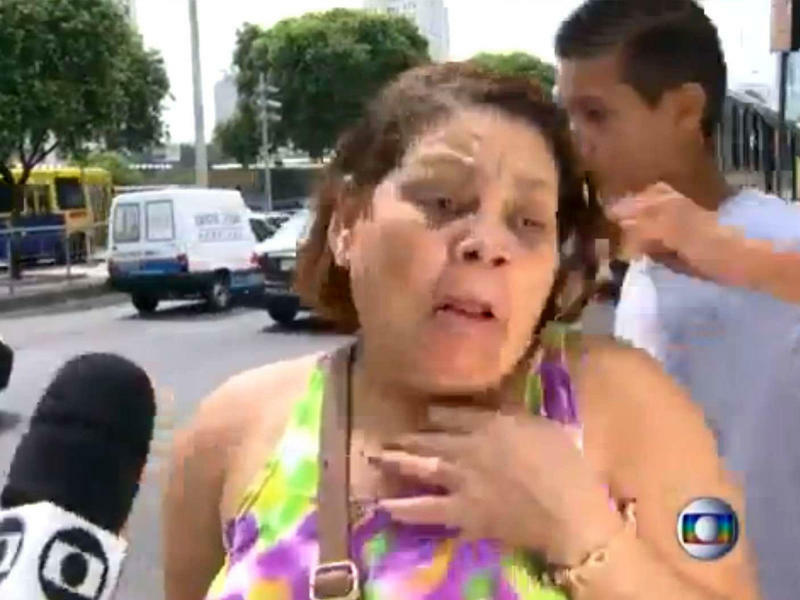 This is the front line of the war on dengue fever in Brazil's largest city. 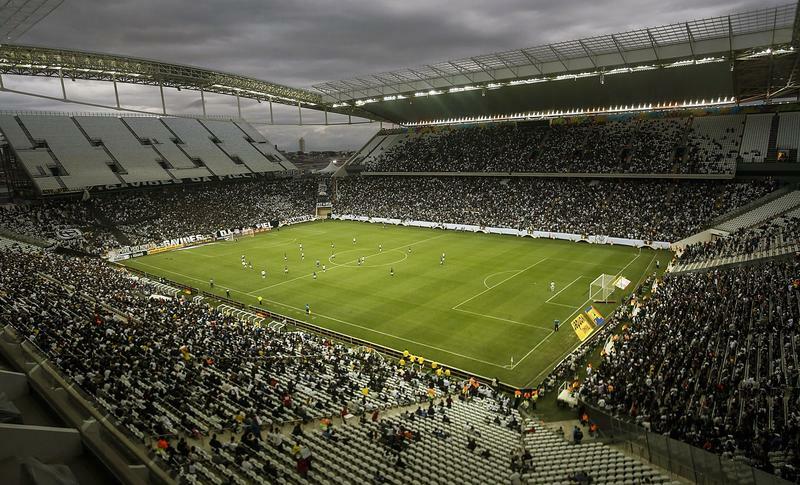 The road to World Cup glory in Brazil doesn't start in fancy soccer clubs or private schoolyards. It often begins in places like this poor neighborhood called Rio Pequeno in Sao Paulo and on a dirt lot, where a group of children are playing soccer. Brazil is hosting the World Cup, which starts in less than a month, and the country is also favored to win. Brazil is already a five-time champion and it has played in every World Cup since the tournament's inception. Editor's Note: NPR's Lourdes Garcia-Navarro, who has worked extensively in the Latin America and the Middle East, recently compared the sexism she found in both places. You can read her original essay here. It sparked a strong response from readers, and we asked her to address a number of those issues. A man throws acid on a woman's face. A mother is killed because her partner believes she slept with another man. 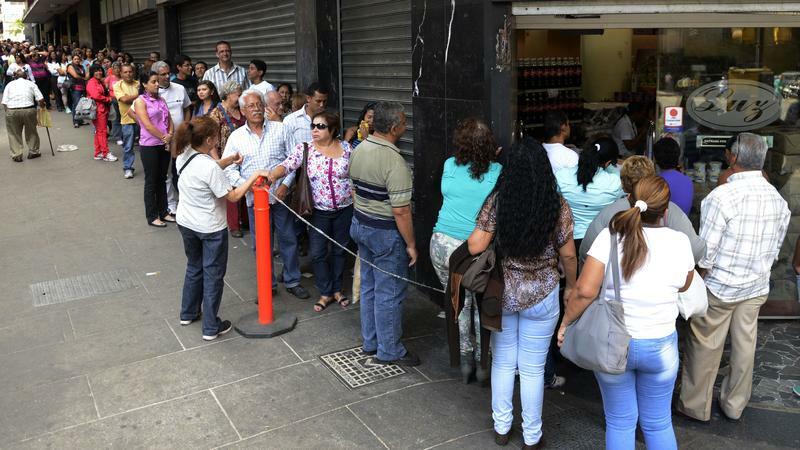 The Venezuelan capital, Caracas, can be one of the most expensive cities in the world — or one of the cheapest. It all depends on how you exchange your dollars. At a fast food restaurant in the city recently, a pretty tasty plate of chicken and rice cost me 160 bolivars. At the official exchange rate set by the government, that works out to a little more than $25; at the black market rate, it's just $2. 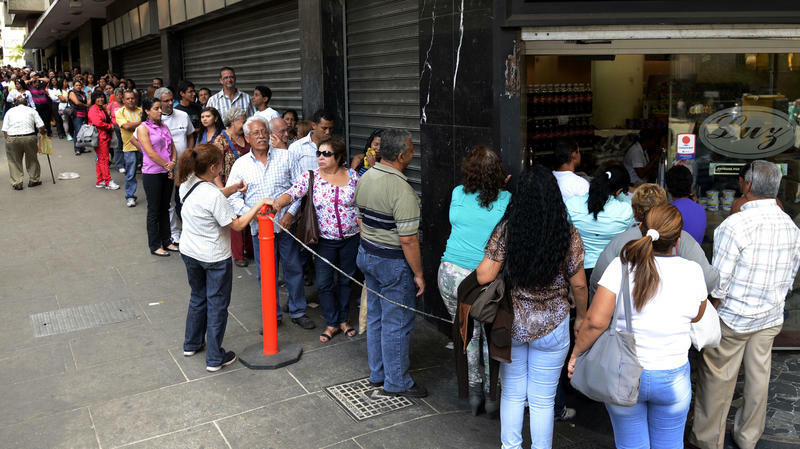 Needless to say, most anyone who can change money on the black market in Venezuela does so. On the surface, these two images couldn't be more diametrically opposed. What could the two have in common, right? What a woman wears — or what she doesn't wear, in Brazil's case — is often interpreted as a sign of her emancipation. 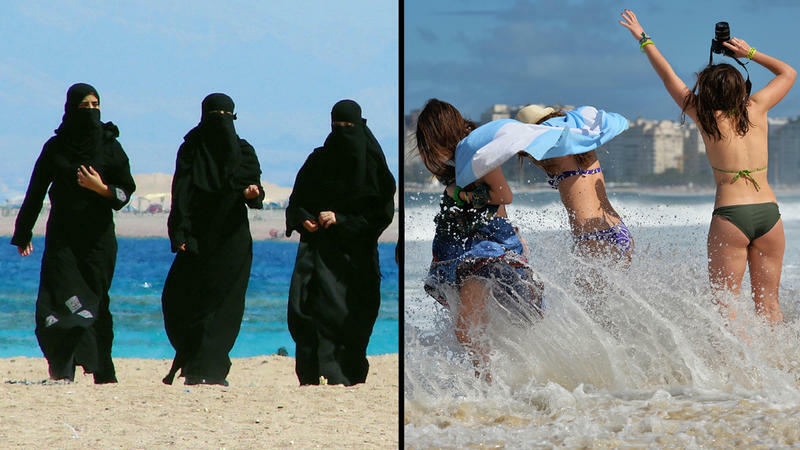 The veil, for many, is a symbol of female oppression; the right to wear a bikini, one of liberation.